April 27, 1978 was a pleasant, sunny day in Kabul. It was Thursday. I worked at the American embassy and, in harmony with Islamic custom, our “weekends” were Thursday and Friday. I went horseback riding that morning. It was spring. The valleys were emerald green and dotted with orange-blooming pomegranate trees. Driving home at noon, I noticed nothing amiss. Afghanistan was the most wildly fascinating and exotic country in the world. Cars and buses shared the roads with camel caravans and herds of sheep and goats. Nomad tents dotted the valleys. Carpets, textiles, and exotic antiques attracted shoppers. The transitory hippie population — we called them “world travelers,” WTs for short — smuggled drugs and smoked hashish. The 20th century occasionally intruded. The first television station had begun broadcasting a few months earlier. To make an international telephone call, you went to the telephone company office, paid in advance, and waited, often a good while, until an operator managed to connect you. Afghans were mostly friendly to Americans and other foreigners — although it was rare to break through superficial hospitality to enjoy a close relationship. You might know a man for years but never meet his wife. Women were only rarely seen on the streets and almost all wore a chadri, the long, pleated, garment that covered them from the top of their head to their ankles. Occasionally you would see stylish shoes and a nicely shaped calf merging from the folds of the chadri, now more often called a “burka.” A woman’s place was in the home. Men even did most of the shopping. The literacy rate for women was one percent; for men it was about 20 percent. Foreign women were exempt from wearing the chadri, but were occasionally jostled on the streets by offended Afghan men. The United States and the Soviet Union had competed for influence in Afghanistan since the beginning of the Cold War. The Soviets were dominant and especially influential in the Afghan army. The United States, though a distant second, had sizeable aid and cultural programs in Afghanistan. The United Kingdom had the most beautiful embassy in Kabul — a legacy of one of the several British invasions of the country during the Raj. Several Peace Corps Volunteers were at my house when I got home that day. We had a baseball game scheduled that afternoon. I played center field on the embassy team. My wife, Kay, the Peace Corps medical officer, had invited the Peace Corps team to assemble at our house. We had two children. Chuck, our ten-year old son, was home; our thirteen-year old daughter Amy was attending an event at the International School on the other side of the city. “Something funny is going on,” one of the volunteers said. “What?” I was immediately interested. Several recent events had made me believe that the autocratic government of Mohammad Daoud was losing its grip. “Let’s go take a look,” I said. Several volunteers and I piled into my old Land Rover and we headed for the Defense Ministry about a mile away. We got only as far as Ariana Square. Uniformed soldiers blocked the street leading to the ministry. Several men who appeared to be in charge were wearing traditional clothing rather than uniforms and had AK-47s slung over the shoulders. “Let’s go to the embassy,” I said. It was only a few blocks away. When we arrived several embassy officers were standing on the front steps on the Chancery. “I hope you have plenty of beer,” they shouted as they drove away. We were speculating on events when Ambassador Ted Eliot, a tall, aristocratic, Boston Brahmin, appeared. “Will you go out and see what’s going on?” he asked me and another embassy officer. “Sure,” I responded, although I sounded a lot more self-assured than I was. We checked out two-way radios and got a driver and a Chevrolet van from the motor pool. We cruised up and down the streets of Kabul. With the exception of the area around the Defense Ministry all appeared very normal, a typical crowded Thursday of shoppers and sojourners. Normal, that is, until we came to the Ministry of Interior. There, standing rigidly in formation in the courtyard, were about one hundred policemen. As we passed by, they began to deploy to the street. A moment later we heard the rumble of tanks in the distance — a sound so low that you felt it in your bones before your ears heard it. With the police behind us and tanks in our front we agreed that it was time to bail out. The ambassador’s residence was a block past the Ministry of Interior. We pulled up to the gate and honked. A guard opened the gate and we zoomed in. The residence was a rambling one-story house with a large pleasant garden bounded by an eight-feet tall wall. A tennis court and a vegetable garden and orchard were in front of the house and a swimming pool was off to one side. The ambassador’s wife, Pat, and a visiting couple were standing on the terrace trying to see what was going on beyond the wall. They had heard the tanks. “I believe,” Pat said calmly, as the tanks rumbled by. “We should take cover inside.” I was hoping she would suggest that. The war began just down the street. We peered carefully out the windows, but we couldn’t see anything on the other side of the wall. Cannon and machine gun fire shook the windows and the sounds reverberated around the stucco walls of the house. Nobody is much use in a crisis until he ensures his family is safe. The telephone was still working and I called home. Kay and our son Chuck were there along with the Peace Corps Volunteers. But where was my daughter Amy? I telephoned the International School. The kids, I was told, had all been evacuated to the homes of several Americans living nearby. About that time the telephone lines were cut. But the embassy doctor had a radio at his house and he lived near the school. I called him, hoping for news of my daughter. “Amy’s here,” he said to my great relief. He had about twenty high school students taking refuge at his house. There had been no shooting yet on his side of town, but he could hear the war going on near us. Unfortunately, there was no way for me to tell my wife that Amy was safe. She didn’t have a two-way radio. The shooting down the street died away and migrated toward the center of the city. We ventured outside onto the terrace. Hundreds of Afghans were sitting on a mountainside a few hundred yards away. They had a front row seat to the events below them. I had a cup of coffee in my hand when the first fighter planes came over at tree-top level. Few things are more startling that a jet plane — they were SU-7s — appearing suddenly just over your head with an earth-shattering scream. I jumped about a foot into the air, bumped into the ambassador’s wife, and spilled my coffee all over her. The first plane was followed by a second and a third and all loosed their rockets toward the palace in the center of town, the office and the home of President Daoud and Naim, his brother and closest advisor. We again sought safety within the thick walls of the house and this time we stayed inside as the sounds of warfare spread all over the city. We had a nervous dinner, topped off with a hot fudge sundae as a special treat. After dinner, as it was getting dark, I seriously needed a cigarette. I was a heavy smoker in those days — as so many people were. There were no cigarettes in the ambassador’s house. A Palestinian friend lived next door and his second story overlooked the wall separating the two compounds. He was a smoker. I ran out the door of the house, dashed through the vegetable garden, pausing to collect a handful of pebbles, skirted the tennis court and pulled up in the shelter of the wall below a window of my friend’s house. The cacophony of battle was loud. Eventually, Taher heard the pebbles hitting his window and peered out with trepidation. “It’s Larry,” I shouted. “I need cigarettes. Please throw me some.” Taher tossed several packs of cigarettes out the window into my eager hands. I wish I could say my valiant dash for cigarettes had a purpose more noble than feeding an obnoxious habit. Back in the house, we turned on Radio Afghanistan to see what we could learn in the way of news. Martial music was soon interrupted by a stern voice intoning the same statement over and over. The Farsi was stilted and formal, but I understood. The “Khalq” of Afghanistan were fighting against repression. The word “Khalq” was the tipoff. Until then we had only guessed that it was the communists attempting to overthrow the government. Now, we knew for certain. “Khalq” was the name of one of the two wings of the People’s Democratic Party of Afghanistan (PDPA) and the frequent repetition of the word left us in no doubt that it was, in fact a communist-led coup d’etat. President Daoud had overthrown his cousin, the king, and the monarchy in 1973, and was believed at the time to be very close to the Soviets. However, he had became more and more independent — typical of Afghan leaders. Only a few days before, he had ordered the arrest of the PDPA leaders. A few, however, especially military officers, had evaded arrest and they were leading the assault on the government that evening. The aerial bombardment of Kabul began in serious about midnight. Six SU-7s made run after run, their flight path right over our heads, to fire rockets at point blank range. All of downtown Kabul seemed to be ablaze — although later we were surprised at how little damage all the bombing had caused. The bombing died down. Helicopters with searchlights circled over the city but weariness overcame our fear and excitement and we all went to sleep. I fell asleep on a sofa. The next morning was quiet, although we could hear the sounds of battle on the opposite side of town, separated from us by a mountain. I sat down with a cup of coffee in a lounge chair beside the swimming pool and turned on the radio. “A pall of smoke hangs over Kabul this morning,” BBC announced, “and ten thousand people are believed to be dead.” Actually, it was clear and beautiful and our peace was disturbed only occasionally by the tat-tat-tat of nearby automatic weapons. Nor were 10,000 people dead. Probably a few hundred were. Nobody ever counted. The ambassador called us on the radio to say that under no circumstances were we to venture out on the streets. We were not to take any chances. About that time, I heard a honk, a guard pushed the gate open, and my wife drove in. “I came out to find Amy,” she said. “But the soldiers won’t let us go to the other side of town.” She was worried sick about our daughter. We called Amy on the radio. She and the other students had survived the night without incident, although only a few minutes before they had witnessed a dogfight between two fighter planes. One of the planes had gone down in flames. We learned that earlier that morning, the rebel soldiers had surrounded the palace and demanded the surrender of Daoud and Naim. Instead, they snatched up pistols and charged the soldiers and were killed in a hail of bullets. Six fighter planes plus a few tanks and several hundred soldiers had overthrown the government of Afghanistan. Daoud loyalists had been too confused and disorganized to organize a defense or counterattack. With all the ordnance being tossed around, it was a small miracle that no foreigners and relatively few Afghan civilians were killed in the coup. A house full of Peace Corps Volunteers was flattened by a bomb, but nobody was seriously injured; a German friend had a rocket rip through a wall in his house, barely miss him, and exit another wall without exploding; an Afghan friend was hit in his arm by a bullet. The character of the new government soon became clear. The embassy sent a telegram to the State Department announcing “what the British first, and later the Americans, tried to prevent for a hundred years has happened: the Russian Bear has moved south of the Hindu Kush.” The Soviets had not helped much in the coup, but they enthusiastically began to make of Afghanistan a puppet state. It also became clear that the United States was unwelcome and we began closing down our aid and peace corps programs and reducing the embassy to a skeleton staff. My family and I stayed on a few more months, but the situation became ever more frightening. The communist coup d’etat was a tragedy. The Daoud government was hardly enlightened, but Afghanistan had been relatively safe and peaceful. The new communist rulers stupidly changed the colors of the flag from Islamic green to communist red. Moreover, their clumsy efforts to effect revolutionary change in the conservative and traditional society incited a full-scale rebellion. The communist leaders quickly began fighting among themselves. Within a few months more than one-half of them were dead or in exile. The Soviet Union despaired of the leadership of the Afghan communists — who also showed unforgivable signs of independence from their Soviet mentors. On Christmas day 1979, the Soviets invaded the country and installed a puppet government, doubtless believing that the Afghans were incapable of serious resistance to a modern army. They were wrong — and we still feel the reverberations today. Afghanistan chews up would-be conquerors and reformers. 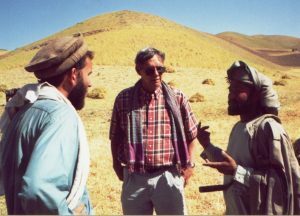 Foreign Service Officer Larry Clinton Thompson served in Afghanistan from 1975 to 1978. Following his retirement from the Department of State in 1991, he worked for Refugees International until 2005. He has written two books, one about the Boxer Rebellion in China and the other about the Indochinese refugee crisis. Next Post:America’s Unipolar Moment of Renewal or Collapse?